When it reaches payday, one of the first shops I always go into is Superdrug to top up on my toiletries and beauty essentials. It’s the type of shop you go into for one item and always come out with a basket full – new products you want to test, items that are better than half price or something you’ve been meaning to pick up for ages. Nailcare was my first port of call when recently going into Superdrug. I really wanted to pick up a bottle of the Sally Hansen Advanced Hard As Nail polish after borrowing some of mum’s a couple of weeks ago. My nails have been recently so weak due to a lot of gel manicures, and maybe not necessarily removing them correctly and whilst staying with my mum, to protect my nails I applied one layer on the Sally Hansen Advanced Hard as Nails. I then noticed after one week that my nails were starting the grow and snagging much less. I was sold, and instantly wanting to get a bottle for myself. 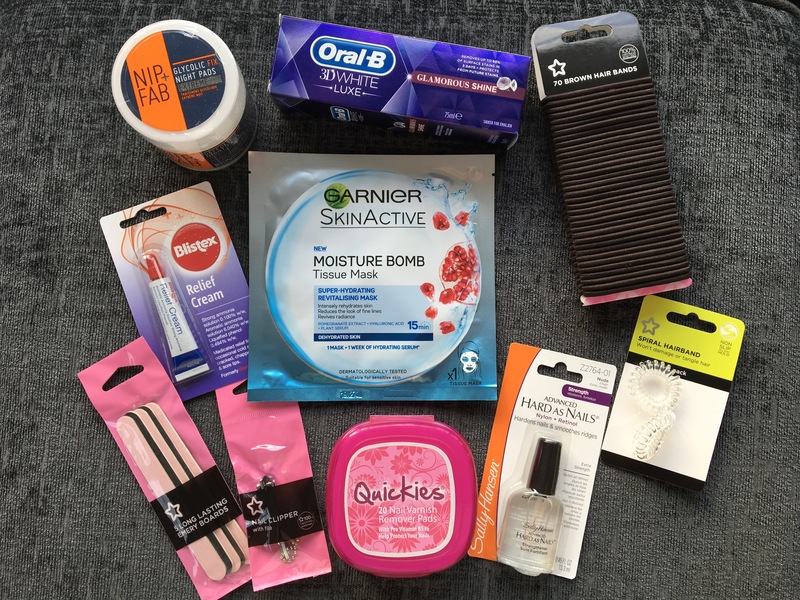 Whilst also in the nail aisle, I also picked up a few nails essentials to keep in my desk at work just in case of any nail emergencies – Quickies Nail Varnish Remover Pads, nail clippers for any snagged nails and emery boards to keep a couple at work and one in my handbag. I then visited the skincare aisle – one of my favourite aisles! I needed to pick up some more Nip & Fab Glycolic Fix Night Pads (which I’ve previously raved about!) and these were ‘better than half price’ at £6.45 (usually around £14 per tub). It was a shame there was only one tub left on the shelf otherwise I would’ve stocked up on couple! I then picked up my all time beauty essential – Blistex Relief Cream for lips. I’m never without a tube of this stuff in my makeup bag because it’s the only thing that will heal my chapped lips. Whilst walking down the aisle I also noticed the Garnier Moisture range. I’ve already picked up the night cream previously (more on this on a future post) but I hadn’t been able to lay my hands down on the tissue mask so grab one of these as well! The last items in my basket was a tube of toothpaste and hair ties. The Oral B 3D White Luxe Glamourous Shine toothpaste is my favourite toothpaste at the moment and this was also on ‘better than half price’ so I picked up a spare for my bathroom cabinet. I also picked up a mountain a hair ties – 70 hair bands to precise! Anyone else’s hair ties seems to go missing all the time? Hopefully these will keep my going for a while haha! I also picked up some spiral hair bands which claim to not damage or tangle your hair. I’ve seen a lot of these types of hair ties before, so wanted to try them out for myself out. Do you love a trip to Superdrug? What usually on your basket?